Asia Pacific based packaging company Loscam has released its new Intermediate Bulk Container, IBC I8, designed for the transportation of liquids and available for food and beverage manufacturers in Australia. 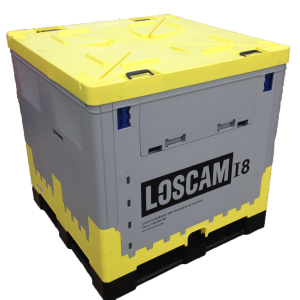 Loscam said the IBC I8 is made from polypropylene and features a hygienic ‘bag in a box’ system which makes it easy for food and manufacturing companies to fill, transport and discharge product. Loscam is a leading provider of returnable package handling solutions for the supply chain industry. Loscam operates in 10 countries throughout Asia Pacific, including Australia. The Company was established in the Asia Pacific region in the 1940s. “We were aware that we needed to extend our product offering to cater for specific customer requirements, so we took the initiative to invest in the IBC I8,” said Naz Miljanic, Loscam Senior Business Development Manager. Ms Miljanic said the IBC I8 allows for the “safe transportation of acidic-based liquids such as fruit juices and vinegars”. “Customers in the food and manufacturing industries can be certain their products will remain in perfect condition from pick-up to delivery, without the risk of damaging the containers which they are transported in,” Ms Miljanic said. Loscam’s heavier duty IBC I6 already caters for more robust and non-acidic applications including dairy, oils, and liquid sugar. Loscam said Nudie, one of Australia’s leading beverage companies, is already using the IBC I8 to transport its fruit juices across the country. “Loscam has always understood what we require to help make our job easier, and reacts quickly to support us to meet the needs of our growing customer base,” said Warren Douglas, Nudie General Manager Operations and Finance. “As we work in a very fast moving environment, we’re always looking for opportunities to optimise our supply chain process,” Mr Douglas said. “The IBC I8 is easy to deliver, empty and return, and importantly it upholds our stringent food safety standards,” he said. Daniel Bunnett, Loscam Executive Vice President for Australia and New Zealand said the release of Loscam’s new lighter weight IBC I8 gives food and beverage manufacturers greater choice when choosing an IBC to suit their needs and further enhances Locsam’s service offering to food and manufacturing customers. “The IBC I8 is yet another example of Loscam delivering solutions for customers which bring benefits to the supply chain process,” Mr Bunnett said. Baskin-Robbins Australia has added two new options to its menu.